Well, first, thanks to Jo for a sharp and generous assessment. 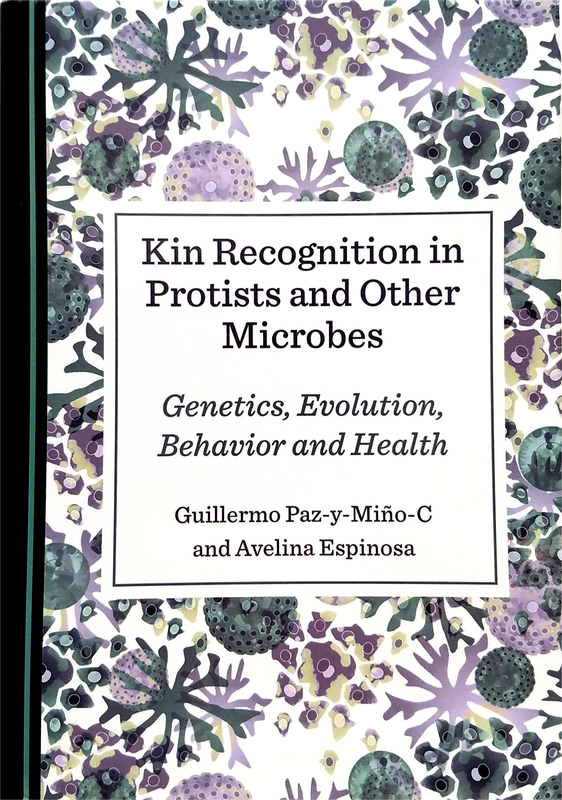 Avelina Espinosa (my coauthor) and I were quite pleased to see that Jo grasped the book precisely in the way we wrote it, plus the intention with which we put it together. We spent much time conceptualizing the chapters, their order and content, the illustrations and terminology boxes, the recapitulations of previous sections prior to “diving” deeper into more complex themes, and the didactic summaries at the end of each major subject. Indeed, Jo got it just right. We purposely dedicated a comprehensive chapter to kin discrimination/recognition in bacteria (most case studies) and Archaea (a few case studies). 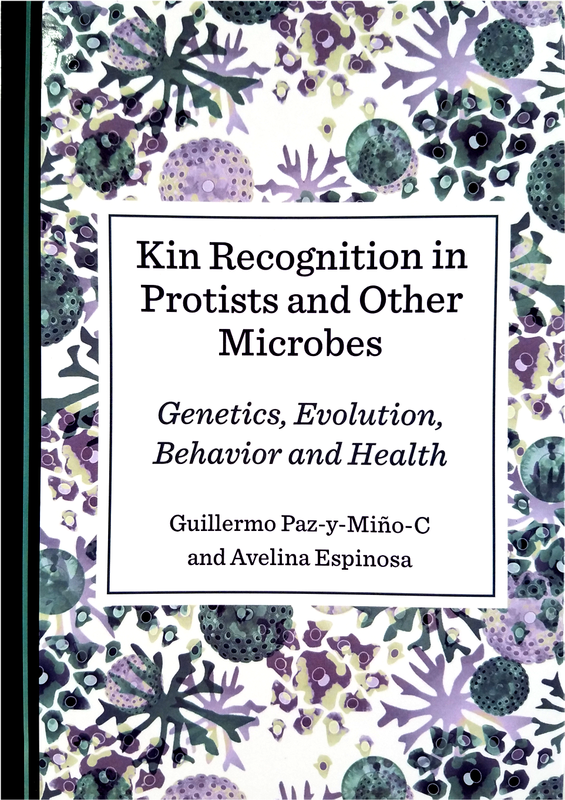 In fact, there is so much excellent research in prokaryotes that a book dedicated entirely to them should be compiled (not by us, but by somebody else). 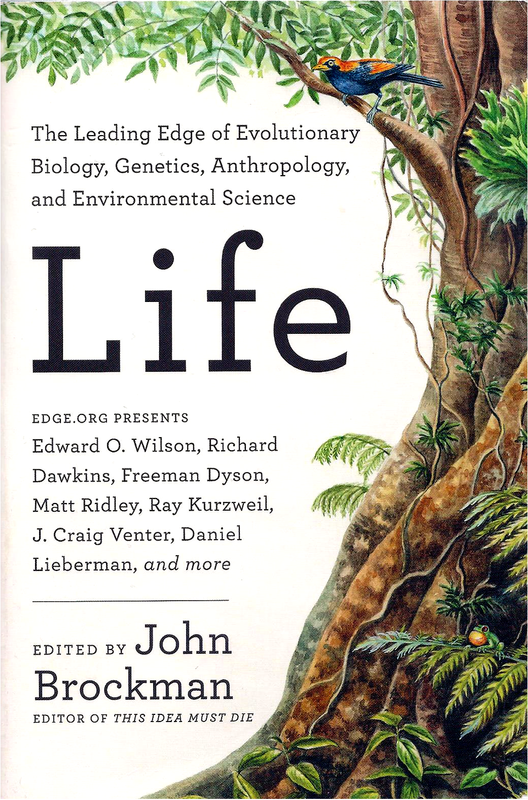 Yes, as we noted in the book “…the field of kin recognition, has no consensus on definitions or proposed mechanisms, likely due to the vast diversity and complexity of life histories across organisms, and also because researchers use terminology depending on circumstances or preference…” We deliberately avoided the discussion of terms and the way they have been used by specialists in the field, a debate that goes back decades, and a topic that might require a separate review for comprehensive coverage. Terminology guides us and is central to scientific inquiry; but it can, occasionally, drag us back and prevent us from making progress, or even accepting the obvious, like “learning abilities” in microbes, which continue to be skeptically honored by scholars due to the customary deference for “high-cognition learning in humans” versus the “learning-like mechanisms” in other organisms. Research with microbes suggests that learning is ubiquitous in nature and that “unicells” sense stimuli coming from the environment, selectively react to chemosignals excreted by themselves or others, store information about such signals and retrieve it when needed (although, in our book we linked “potential learning” primarily to protists’ recognition/discrimination of close genetic relatives, kin). 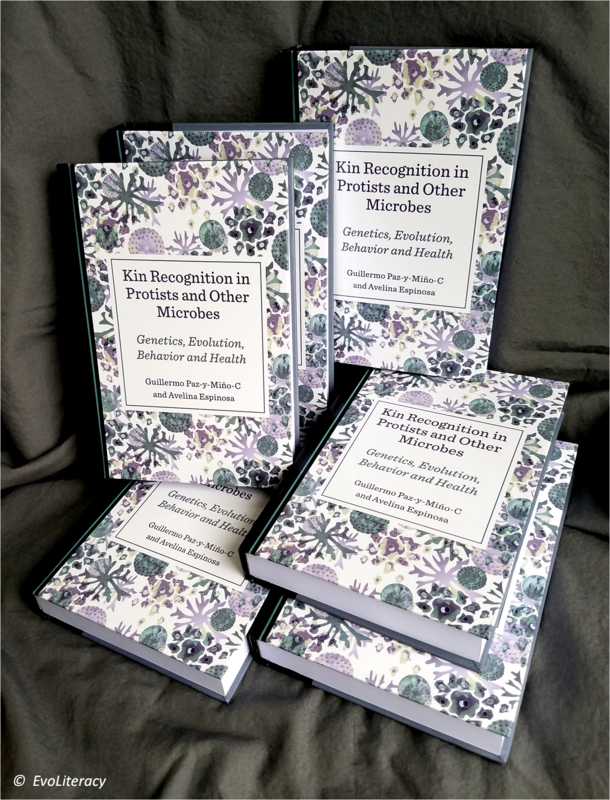 ABOUT THE BOOK – Kin Recognition in Protists and Other Microbes can be ordered directly from Cambridge Scholars Publishing. 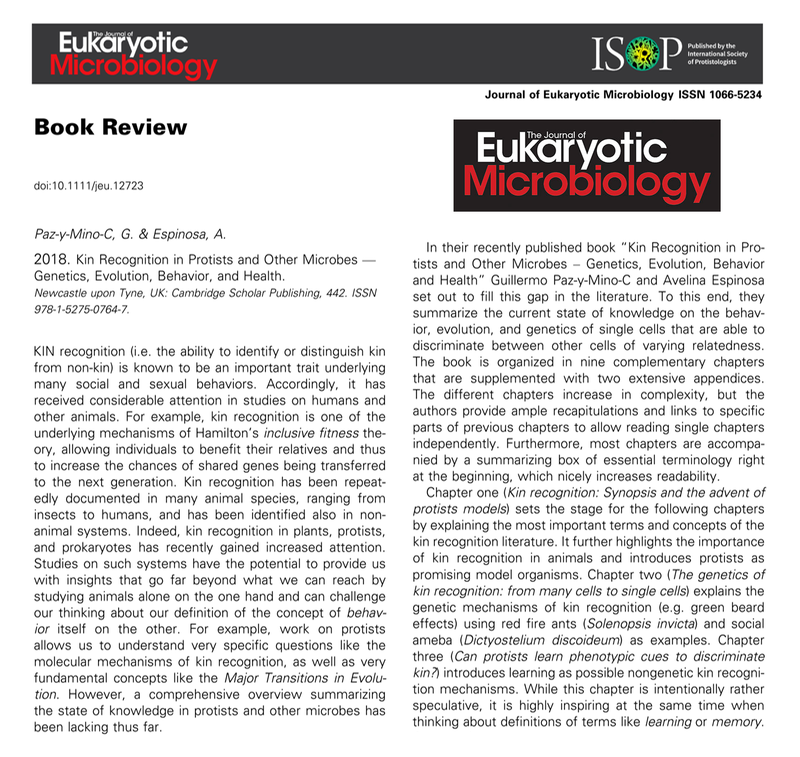 The publisher has made available a “VIEW EXTRACT” (in PDF), which includes the first 30-pages of the book: Cover, Table of Contents, Acknowledgments, Preface, Chapter ONE and the beginning of Chapter TWO. 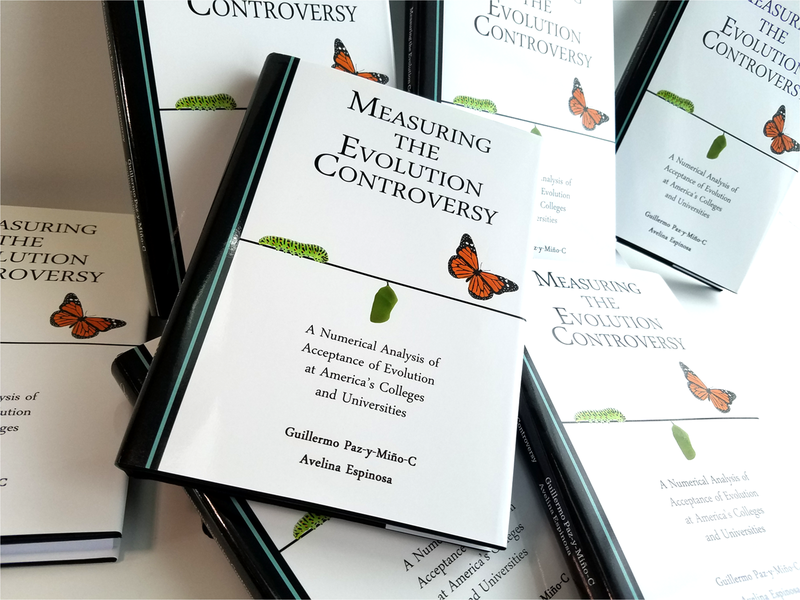 Measuring the Evolution Controversy: A Numerical Analysis of Acceptance of Evolution at America’s Colleges and Universities is being featured among other top three Best Sellers of 2017 at Cambridge Scholars (link here). The publisher is promoting the book on its website and offering convenient options for ordering it until November 30th. 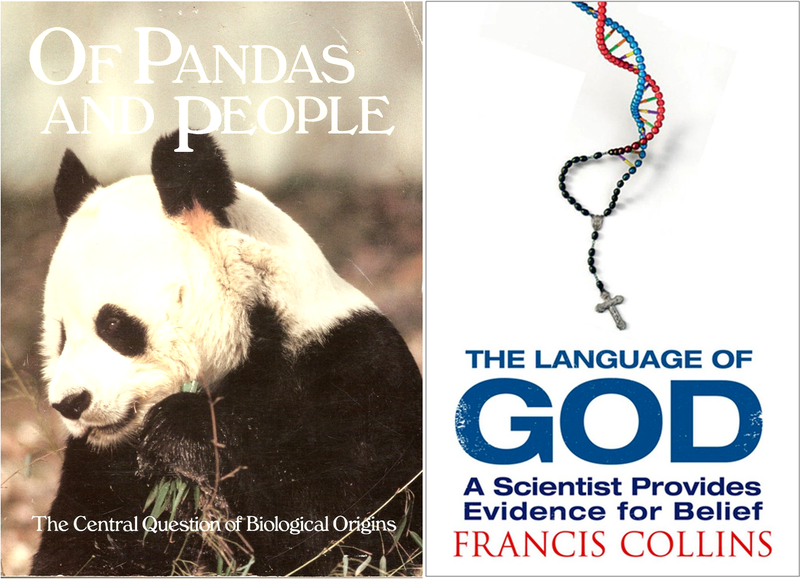 Doctor Barbara Forrest writes that, in Measuring the Evolution Controversy, “Paz-y-Miño-C and Espinosa… show that although anti-evolutionism typically begins with religion, it is a multi-faceted problem that intersects with political and cultural ideologies. Gathered through careful research over a period of years, their data will enable scientists and defenders of science education to comprehend the roots of the evolution controversy and counteract resistance to evolution more strategically and effectively.” Doctor Forrest is co-author with Paul R. Gross of Creationism’s Trojan Horse: The Wedge of Intelligent Design; she was an expert witness for plaintiffs in the Dover-Pennsylvania 2005 trial on Intelligent Design (Kitzmiller et al. v. Dover Area School District). Why do people not accept evolution? 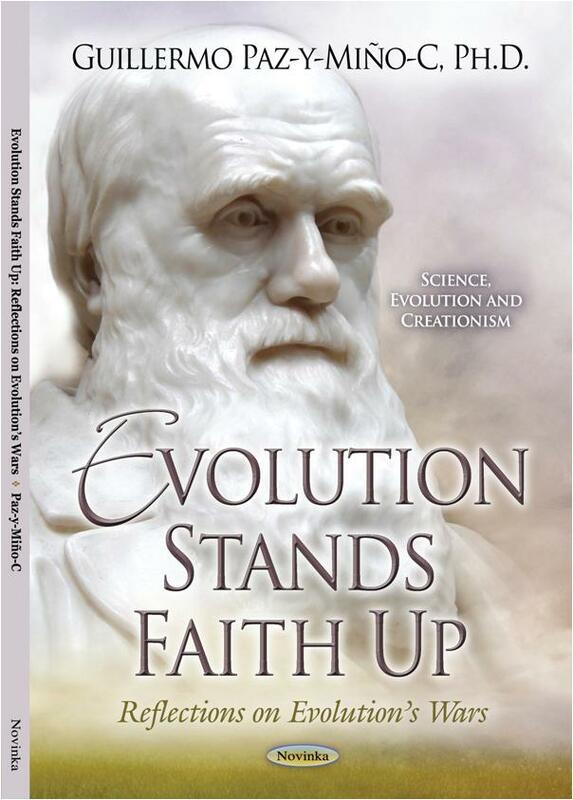 Paz-y-Miño-C and Espinosa explain that “the debate over evolution-and-science versus creationism is inherent in the incompatibility between scientific rationalism/empiricism and the belief in supernatural causation. Belief disrupts, distorts, delays or stops the comprehension and acceptance of scientific evidence.” The authors refer to this proposal as the incompatibility hypothesis, the conceptual foundation of the book. The volume is currently available at 40+ college/university libraries worldwide — EvoLiteracy © 2017. 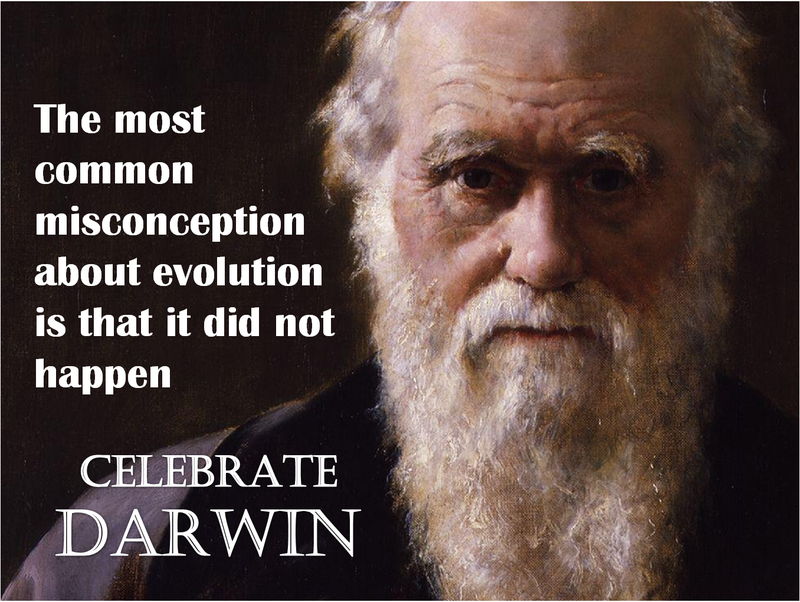 Darwin Day… signifies the celebration of the achievements of reason, science, and the advancement of human knowledge. The igniting moments in human history when light was brought into our own origins, when understanding that ordinary apes, like Homo, were capable of the extraordinary, of discovering the truth and debunking obscurantism; yet we still struggle to make science the sole guiding star in our survival decisions, the reliable source of concern and joy, the toolkit to plan our departure from Earth –before our Sun in agonizing heat engulfs its nearest orbiting planets– and seek home somewhere else in the cosmos. Read FULL article at Darwin Day Awaits Designation. I visited the Down House, Darwin’s Home, in July 2010. Here are a few pictures I wanted to share in celebration of the International Darwin Day, February 12. Prior to visiting the Down House, which is located just a few miles South East of London, I went to Canterbury, Kent, to attend the International Society of Protistologists (ISoP) annual meeting, at the University of Kent. Coincidentally, back in 1991, as an undergraduate student, I obtained a Diploma in Endangered Species Management from the University of Kent, which offered such certification in partnership with the Jersey Wildlife Preservation Trust (nowadays Durrell Wildlife Conservation Trust). Read FULL article at Darwin’s Home. 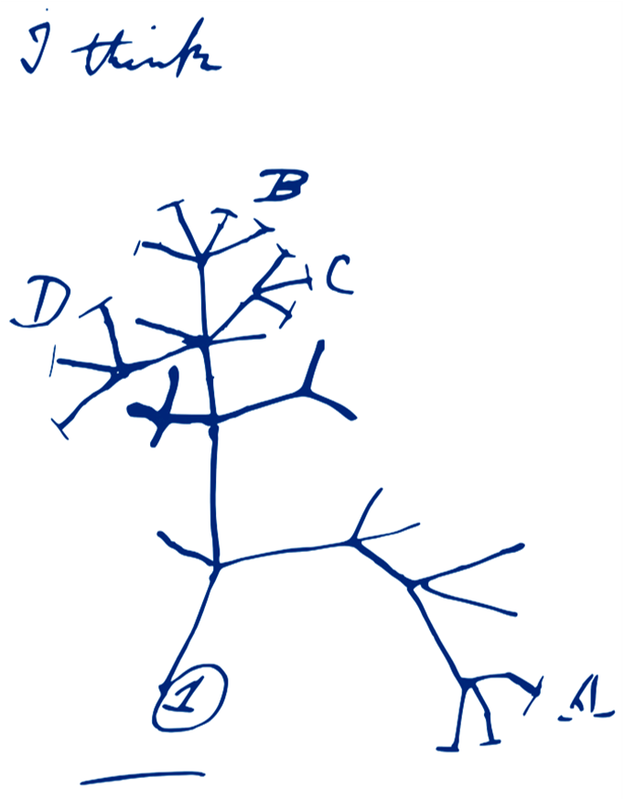 This is one of our most read articles at EvoLiteracy — The yearly celebration of International Darwin Day (February 12) is approaching. Here are some of Darwin’s writings, which reveal how skeptical he became –with age and wisdom– about the existence of God. 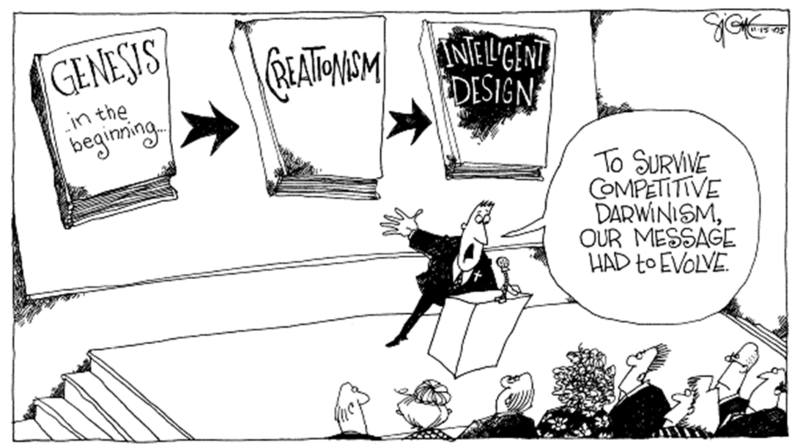 Despite this historical evidence, the pro-religion-in-science crowds, or para-creationists (i.e. theistic evolution, creation science, evolutionary creation), continue to mislead the public by spreading the meme that Darwin was, deep in his soul, a religious naturalist. And that is false. 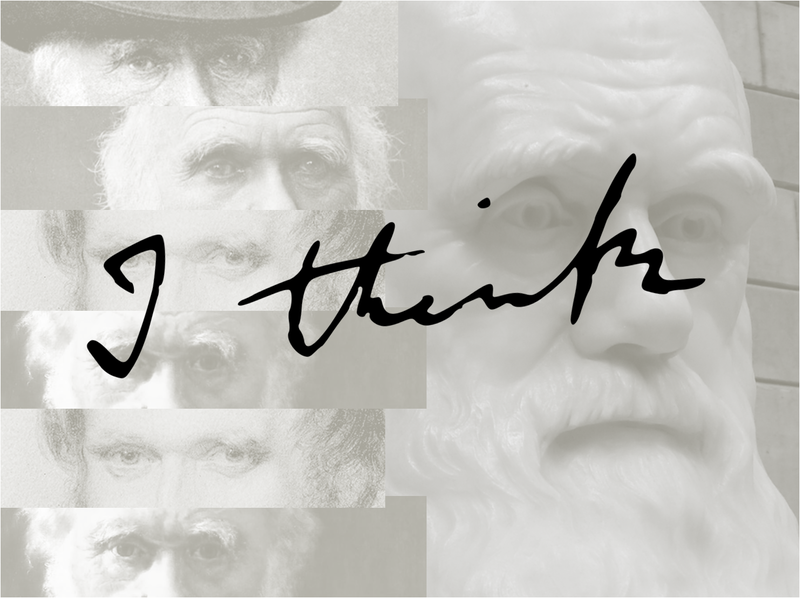 In 1879, Darwin wrote: “…an Agnostic would be the more correct description of my state of mind.” But read below what else Darwin wrote about The Old and New Testaments, Christianity and God in his Autobiography and later documents. 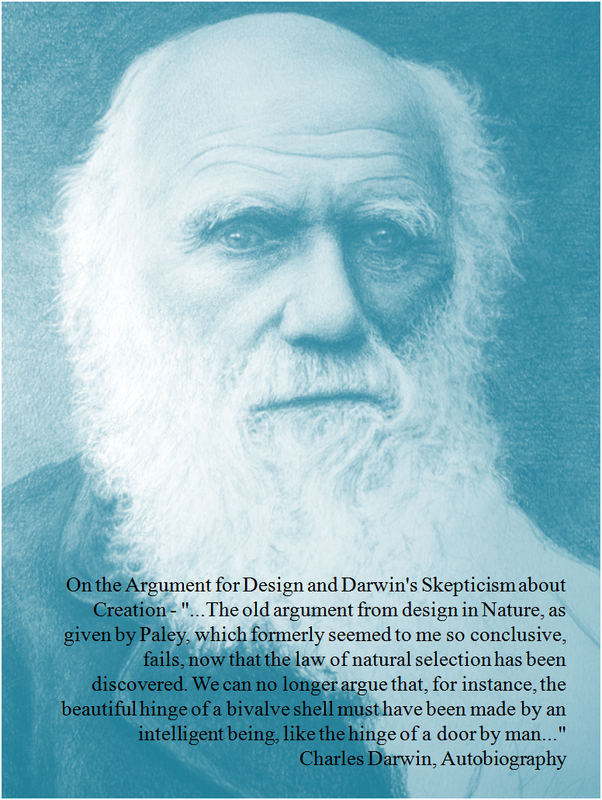 Read FULL article at Darwin’s Skepticism. Yes, women worldwide are, overall, more religious than men. Yesterday, the Pew Research Center released another update to its frequent reports on religion (The Gender Gap in Religion Around the World), which I shared on Facebook. It includes useful maps and descriptive statistics, however, here I summarize only the numeric trends and leave the maps aside (they are didactic). Readers can find the complete report online, as well as the figures and web-links. But first, why do we care at EvoLiteracy News about this topic? One of the reasons (not the only one) is that acceptance of evolution is negatively associated with level of religiosity, as we (and other researchers) have demonstrated in numerous studies. Therefore, the Pew Research report would imply that women, worldwide, accept evolution less than men. But this is –of course– something not addressed by the Pew Research Center in this particular study (see such differences here). Instead the report focuses on speculating about why the gender gap in religious commitment exists, and it does demonstrate that, by just joining the workforce, women become less religious (voilà) –although the gender gap remains. The report, however, disregards the historical oppressive role of religion on all peoples, particularly women. Read FULL article at Are Women More Religious? “…Edward Hitchcock’s collection of fossilized tracks and traces of dinosaurs is one of the largest in the world and the Beneski Museum of Natural History exhibits them as fine art, carved by nature… Under soft lighting, a saturation of textures emerges from or deepens into the flat rocks. 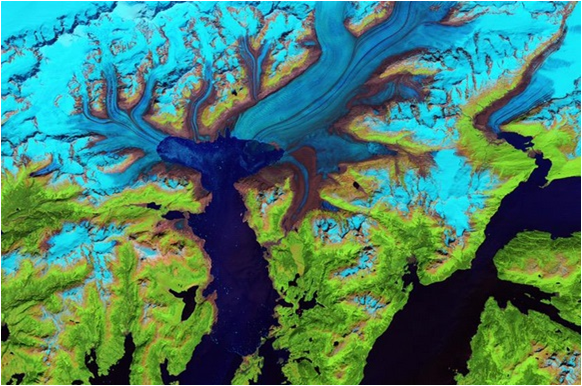 The 200-million-year-old footprints are so exquisite…” Read FULL article at Beneski Museum. I have previously stated that to be reassured that evolution is true one simply needs to visit the New Bedford Whaling Museum. Its displays of skeletons of a North Atlantic right whale with a calf, a humpback, a juvenile blue, and a sperm whale can impress anyone curious to compare human bones to those of cetaceans. And such comparison suffices to infer that common ancestry connects mammalian sea gallopers — whales and dolphins — to us, the upright bipedal apes who live in cities and launch vessels to explore the stars. Read FULL article at Hiking among Trilobites. Unsubstantiated beliefs interfere with the acceptance of evidence. Belief is a powerful cultural pollutant: it disrupts, distorts, delays and stops the assessment of reality, what I call in my academic work “the 3Ds + S cognitive effects of illusory thinking.” Indeed, I explore, at a scientific level, why people struggle when confronting inner beliefs with facts, and for that I examine acceptance of evolution by highly educated audiences —university professors, educators of prospective teachers, and college students at elite institutions, who, despite their fine education, embrace distinctive degrees of superstition. Read FULL article at Golden Age Violins. The reality of evolution is indisputable and, based on current scientific evidence, all people in the world should accept it. Yet, only 41% of adults worldwide embrace evolution, and they do it under the premise that a deity created humans. One in every three people are strict creationists who believe in religious scriptures concerning the origin of our universe and of humans, and explicitly reject that Homo sapiens is an ape —when, in fact, science informs us that humans’ closest relatives are chimpanzees, bonobos, gorillas and orangutans. Indeed, we are all apes. Read FULL article at Evolution Controversy. If completely stretched into a single, long molecular chain, the DNA of a human cell would measure about two meters. During our lifetimes, our bodies would replicate enough DNA that, theoretically, it could be extended from Earth to the Sun, and back, 250 times. 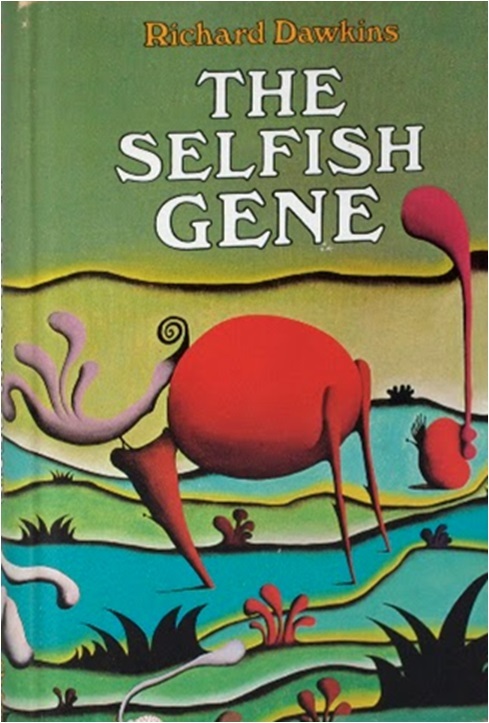 Ample opportunities to accumulate 37 trillion mutations while re-copying the genetic material. Read FULL article at Nobel Prize in Chemistry. 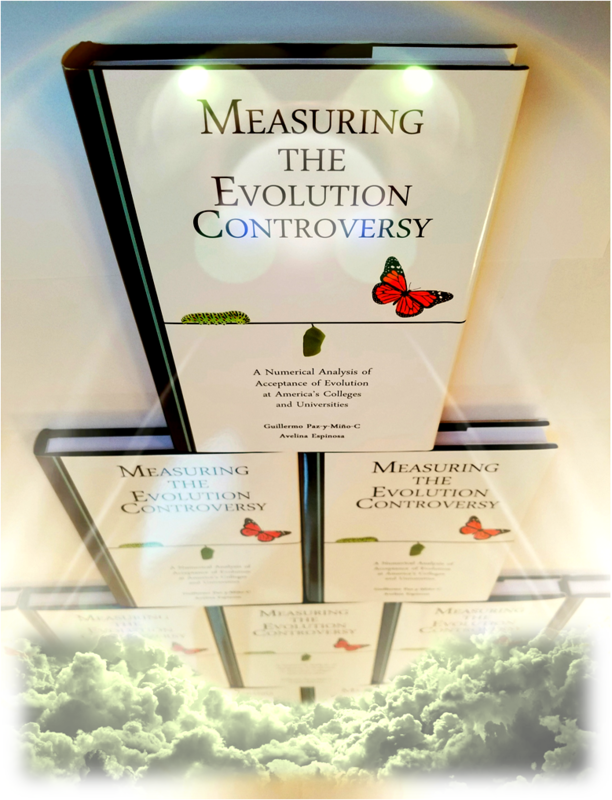 In Chapter Nine of Measuring the Evolution Controversy, we ask: what will be the societal setting in which science/evolution and religion interact in the future? Early in the narrative of the book, before addressing this question, we remark that societal interactions between science and ideology are intricate, and subject to public policy, law, and abrupt socio-economic change. In addition, we sketch a probable world socio-cultural environment —based on statistical demographic projections— in which acceptance of science and evolution could take place in the future. By the 2050s or 2060s, we argue, the world societal dynamics will be quite different in respect to today’s, particularly in four relevant landscapes associated with attitudes toward science and evolution: distribution of wealth, education, migration, and demographics of religious groups. Read FULL article at The Future of Acceptance of Evolution. — EvoLiteracy © 2017.